At this holiday time of year, we all find ourselves reflecting on the past, celebrating the present and looking forward to a future full of hope and promise. At ArtsWest we find ourselves exactly in that frame of mind, as we kick off our annual fundraising campaign with a month-long push and a lofty goal of $16,000. Our 15 year old past has brought to our audiences tears, laughter, songs & dance, and joyous moments that have not only entertained, but we hope have given our patrons pause. Speaking to human emotions, we are proud of the varied programs and art exhibitions that have graced our gallery and stage. And just as we are reflecting back, we are also caught up in the present momentum of planning our 2014-2015 season, as well as working with our upcoming January – June productions of The Little Dog Laughed, Third and HAIR. Looking ahead reminds us that our future is not just about the plays and musicals we produce or the art we hang on the walls. 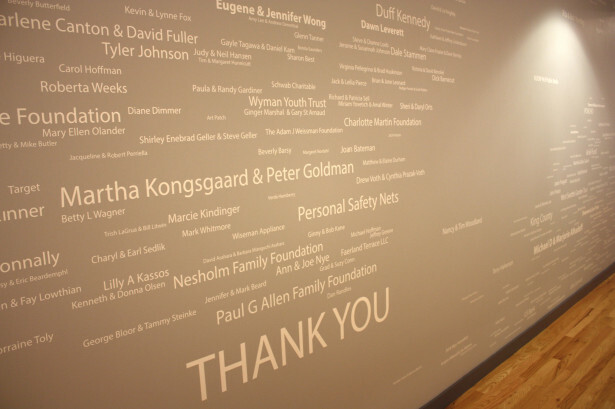 Our strength depends on the support of entire community – our donors, volunteers and patrons. How has ArtsWest touched you? Was it a particular play? A painting that connected with your spirit? Or maybe the knowledge that you have helped a young person in our education program fulfill their dream of walking on stage. Whatever that special memory is, or for the hope you have in our future, we ask that you contribute to our Annual Campaign. We appreciate any gift that you are able to make to us. Pledges can be made through this website with the click and pledge button or through the mail at PO Box 16152, Seattle, WA 98116. Thank you for your generosity and support of our work and mission. This entry was posted on Tuesday, December 10th, 2013 at 1:00 pm	and is filed under General.